Apterae of Aphis brunellae are pale yellow, sometimes with a mid-dorsal suffusion of dark green. They are not wax powdered. In small specimens (body length less than 1.2 mm) the number of antennal segments may be reduced from 6 to 5. The abdominal dorsum is membranous with little or no sclerotic banding. The hairs on the anterior surface of the femora are shorter than the least width of the tibia. The siphunculi are dusky or dark and are 0.92 -1.90 times the length of the pale cauda. The body length of Aphis brunellae apterae is 0.98-1.45 mm. Aphis brunellae lives up the stems or hidden among the flower bracts of self-heal (Prunella vulgaris). It is sometimes attended by ants - one colony we found had been tented over with soil particles. It does not host alternate and sexual forms appear in autumn. 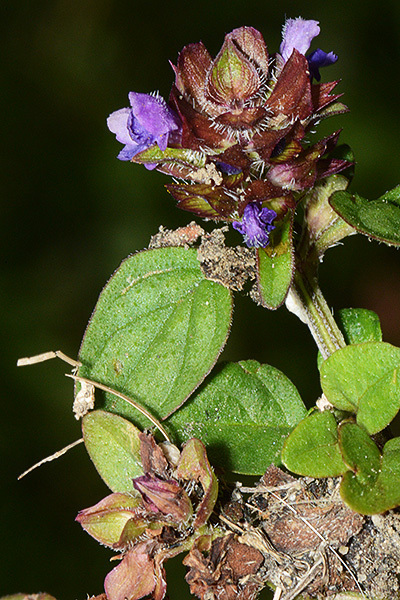 The self-heal aphid was previously believed to be rare in Britain, being only recorded prior to 1984 from Buckingham and Cambridge. It is now also known from Wales (Baker, 2009) and East Sussex (InfluentialPoints, Aug. 2015). Aphis brunellae is widespread in Europe and western Siberia. We have found a few immatures with a 'a mid-dorsal suffusion of dark green' as described by Stroyan, but it is more common for there to be diffuse dark green patches over the entire dorsum (see picture below). 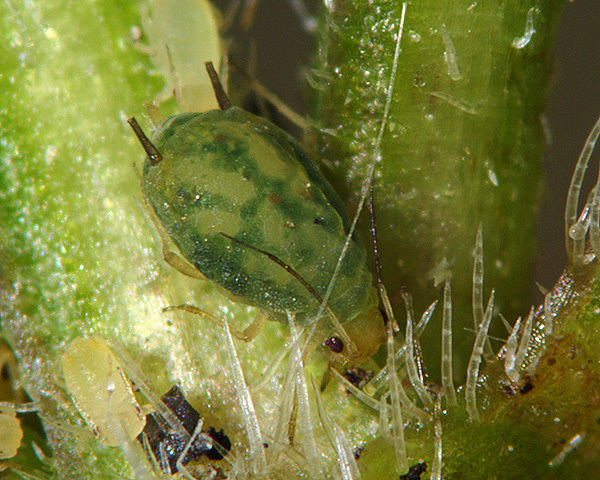 The variable shades of green would appear to enhance the crypsis of the aphid on the greener stems of its foodplant. Aphis brunellae is sometimes tended by ants, usually Lasius niger spp. The ants tend to cover the colony with soil particles, often coating the affected stem (see picture below). 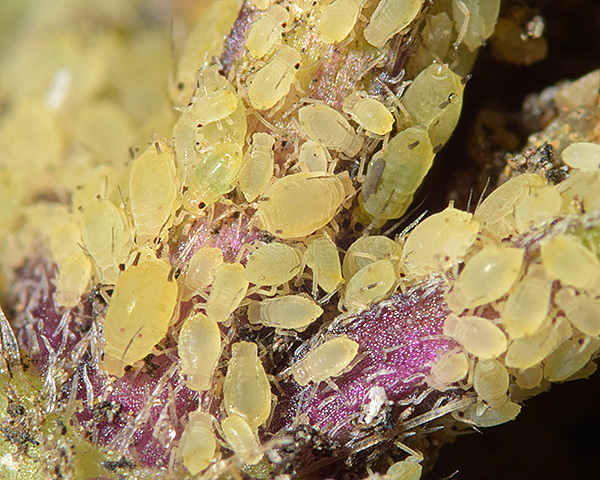 The picture below show the large aphid colony revealed after carefully brushing away the ant tenting. It is perhaps notable than none of this previously concealed colony has the darker green markings, with all individuals being pale yellow. Perhaps the darker green forms only develop when the aphids are not being ant tended and are therefore not concealed from potential predators. 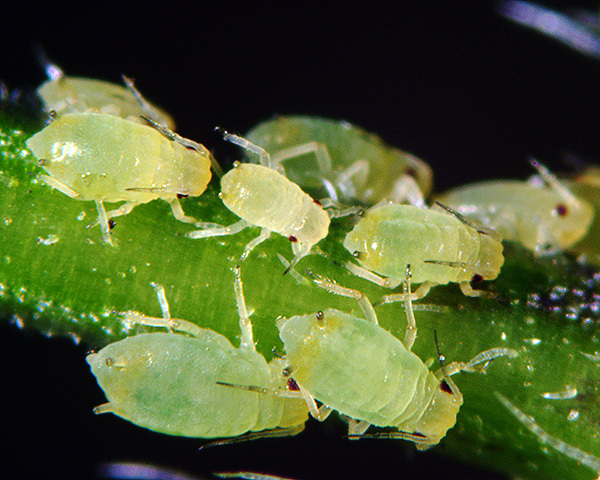 Such aphids are mainly found higher up on the stem where the stem is largely green (see picture below). 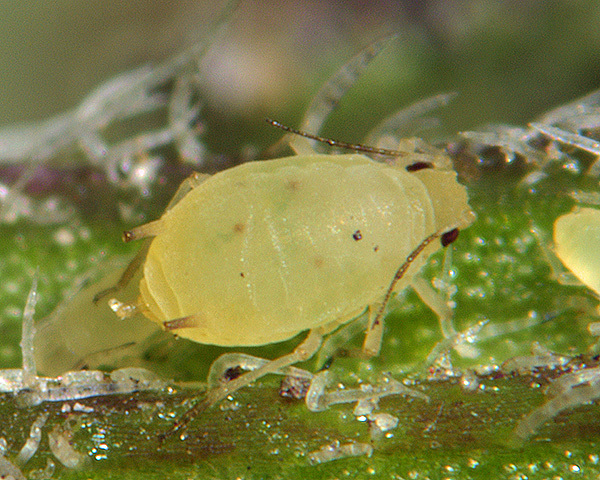 Despite the high density of aphids in the colony shown two pictures above, we only found one fourth instar alatoid nymph and no mature alates. It is not unusual for ant-tended species to have a low frequency of alates in the population.. 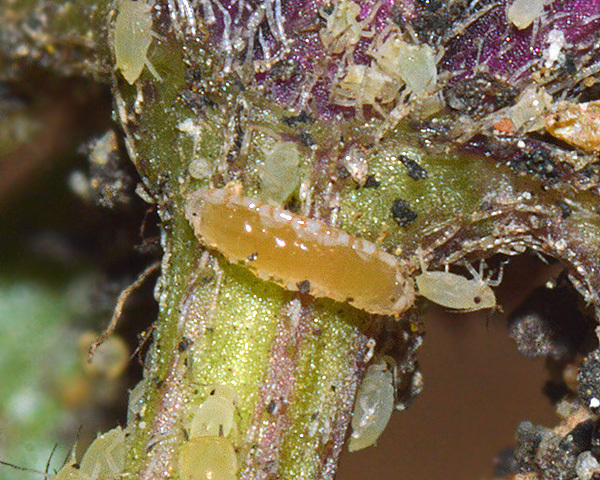 The only natural enemy we have found attacking self-heal aphid colonies was a cecidomyiid larvae which is shown below. Blackman & Eastop list 8 species of aphid as feeding on self-heal (Prunella vulgaris) worldwide, and provide formal identification keys. 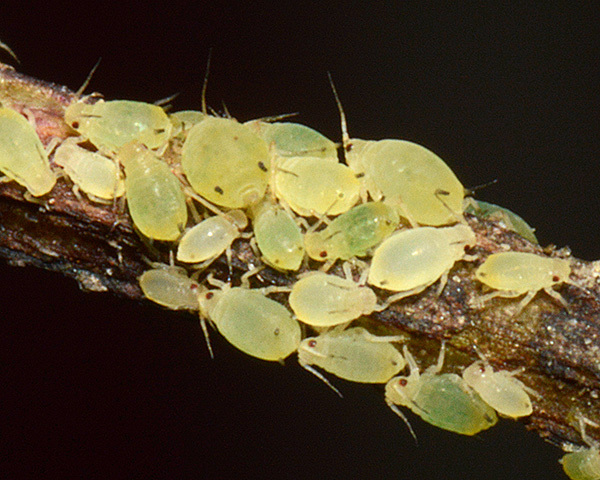 Of those aphid species, Baker (2015) lists 7 as occurring in Britain: Aphis brunellae, Aphis gossypii, Aphis nasturtii, Aulacorthum solani, Macrosiphum euphorbiae, Myzus ornatus and Ovatomyzus chamaedrys.